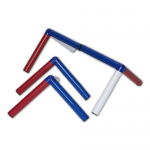 The set of Drill Points can be used in a wide range of individual or small group activities to practice movement, throwing and receiving skills. View the videos below to see them in use. Creating two tunnels with all four Drill Points we created two moveable targets to practice the on and off drive. By using the tunnels as a target it gave an emphasis on the importance of the placement of each shot and also keeping the ball on the floor. Using the Drill Points we emphasise the importance of sliding the bat in when running between the Wickets. Using the 4 Drill Points this activity is an ideal warm up game as it focuses on quick movement and hand eye coordination. This warm up activity gets the hands and feet moving. We flipped over a Drill Point to replicate the base of a single stump. This game incorporates 3 important aspects of fielding; Throwing at the stumps, movement and backing up.